Dine Out Vancouver 2011: Rocky Mountain Flatbread Co.
Last year my friends and I discovered the gems that are there in the $18 menu choices of Dine Out Vancouver. This year L and I continued that trend and our (well, mostly mine…my friends spoil me!!!) 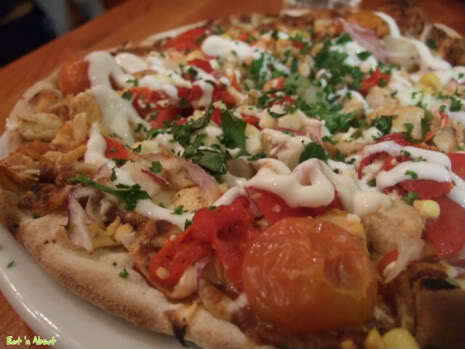 choice was Rocky Mountain Flatbread Company, which is mainly a pizzeria. An organic one mind you. It IS in kitschy Kits after all. Rocky Mountain basically has two large dining areas. 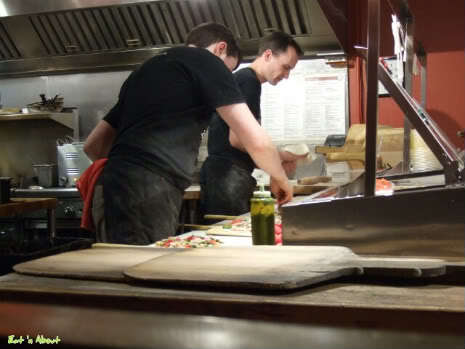 The inner area houses the open kitchen where you can see the pizza-making people at work! 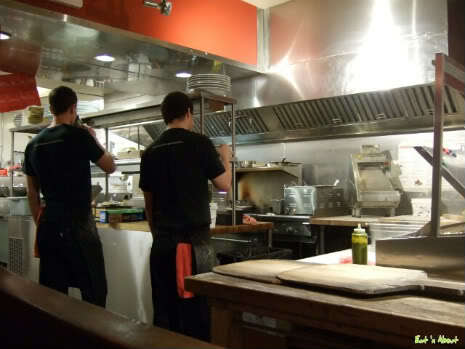 We were lucky to be seated right beside the kitchen. They didn’t even have to walk out of the kitchen to serve us our food! 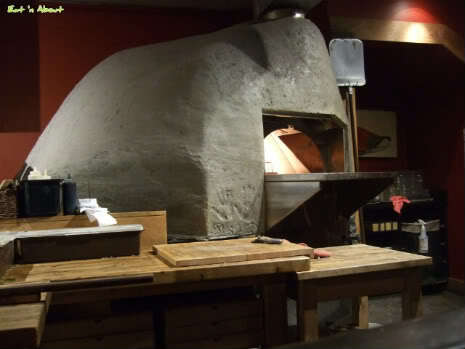 There they also have the pizza oven. The stone exterior is just for show though. The inside of it looks completely industrial. We both started with a salad as our appetizer. Basically the greens are the same, just some additional ingredients and the dressing is different. Normally this would’ve cost $8-9.25 for the regular size. 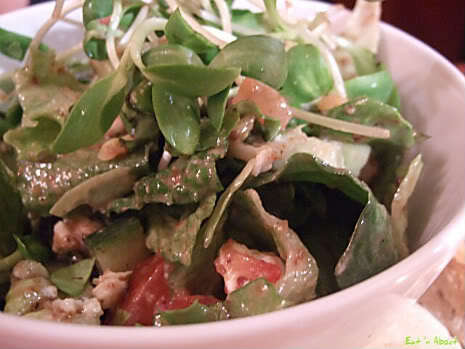 Assorted organic leaves, crunchy cucumbers, ripe tomatoes, shaved red onions & green bell peppers mixed with goat’s cheese in a creamy sundried black mission fig dressing. I actually enjoyed hers a bit more than mine since it was a bit sweeter. The greens were extremely fresh and they didn’t skimp at all on the goat cheese. 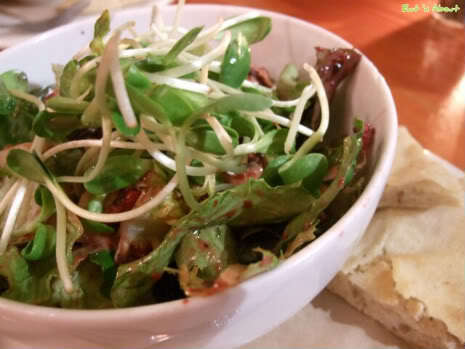 Fresh organic green leaves, brown mushrooms, mango & roasted red bell peppers tossed in a basil & blackberry dressing. This was quite refreshing with just a tinge of sweetness. What I didn’t care for was the blackberry seeds…forgot about that fact when I ordered it. However I did enjoy this quite a bit also. The mango added a nice sweet touch to the semi-tart blackberry dressing. Chocolate tomato chili sauce, red onions, roasted red peppers, marinated cherry tomatoes, jicama root, corn, free range organic chicken, Capriny goat’s cheese, herbs. Finished with crème fraiche. Since I missed out on having the mole sauce at Bandidas before, I had always wanted to try a mole-type sauce. So I was delighted to see this being a choice. As the pizza was sitting on the table as I was trying to finish my salad, L said she could catch wafts of chocolate scent. After a while I could smell it too. Upon tasting, there was clearly a hint of sweet chocolate. It was very, very delightful and surprisingly complimented the other savory ingredients. I was worried that the chicken would be quite dry but that was not the case. They were perfect bite-size morsels. I was also happy to see that the middle of the pizza wasn’t soggy. We also had it on the traditional crust. I felt like eating doughy stuff that night. L’s choice (I swear this was totally her choice) was the Parma Ham (normally $14.75 Reg): Schinken speck (cured ham), brown mushrooms & mango. 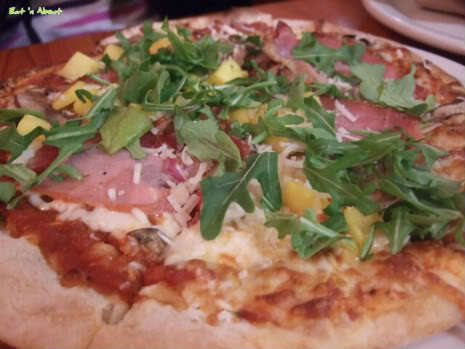 It is then baked in our Artisan oven & topped with roughly chopped arugula & parmesan. The ham tasted a lot like prosciutto, and that’s a good thing as we both love prosciutto. The mangoes were a nice touch also but I didn’t really care for the tomato sauce. Mind you it wasn’t overly sour so that was good. I gotta say though, I enjoyed my Mexicali a lot more. Our dessert choice was the Warm Double Chocolate Brownies with Ice Cream and man was this heavenly. Even though we were both pretty stuffed, we wolfed most of this down. The brownies were chewy, almost like a fudgey texture, with a crispy crust. The unsweetened whipped cream and berry coulis helped cut down the richness but the ice cream added to it. One downer would be that I thought the ice cream was a bit icy though. But seriously, this was so. good. If this place wasn’t so far from home, I would most likely visit this place more. Hopefully I can bring myself back someday to try their other pizzas. 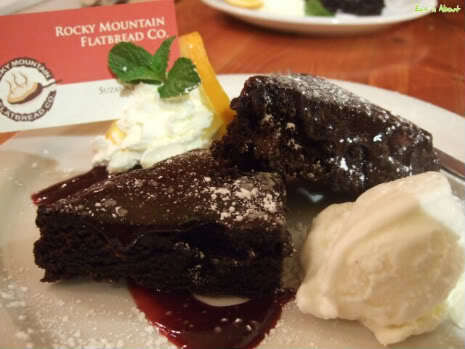 Dine Out Vancouver - Rocky Mountain Flatbread Co.
Next PostNew at McDonald’s! Plus a Giveaway! !